Compared with many other regions in Central and Latin America, Mexico’s stable economy is benefiting the country’s two publicly traded airlines Aeromexico and Volaris. There are apparent opportunities for both companies to stimulate traffic, but their business models are completely different. Volaris characterises itself as an ultra-low cost airline while Aeromexico is Mexico’s only full service airline, leveraging its position at Mexico City Juarez international airport to build what it considers to be a major connecting hub and gateway in Latin America. Ratification of a revised bilateral with the US by the Mexican Senate, and tentative Mexican government approval of a joint venture between Aeromexico and its fellow SkyTeam partner Delta Air Lines, are major steps in Aeromexico’s strategy to distinguish itself as Mexico’s only global, full service airline. Volaris continues to strengthen its business foundations of VFR (visiting friends and relatives) traffic, and diversifying its network into more US transborder routes. Although Volaris is planning healthy capacity growth in 2016, the company believes that there is enough demand to absorb its projected expansion. The Mexican government recently awarded tentative approval to Aeromexico and Delta for a proposed joint venture. However, accompanying the approval was a stipulation that the airlines relinquish eight slot pairs at Mexico City Juarez. It is not surprising that some form of concession was requested by Mexican authorities. Previously, jetBlue has argued that Aeromexico and Delta combined would control nearly half the slots at slot-controlled Juarez, and warned that a grant of “ATI [anti-trust immunity] would likely further inhibit competition at an airport where new entrants and carriers with few slots are already disadvantaged”. On a stand-alone basis, Aeromexico controls 42% of Mexico City Juarez’s seats. During the past two years Aeromexico has been using its position at Mexico City Juarez to create a new rebanking scheme to maximise connections. It moved from a four bank structure to 12 banks, and has calculated that the changes allow for increased connections to 35 additional cities. A joint venture with Delta will further allow Aeromexico to bolster and market beyond connections through Mexico City, and beyond Delta’s hubs in the US. After experiencing some pressure in 2015, Aermexico’s yields grew 4.5% year-on-year in 1Q2016, and both total unit revenue and passenger unit revenues increased 3.3%. The airline’s capacity increased 9.3% in 1Q2016, and for the full year 2016 Aeromexico is forecasting capacity growth of 6% to 8%, which is markedly lower than the 11.5% expansion that was posted by the company in 2015. Recently Aeromexico executives have stated that the lower capacity growth should support a continued improvement in yields. Aeromexico added a raft of new international services in 2015 from Juarez to Toronto, Vancouver, Medellín and Panama City. During 2016 it is launching flights to Santo Domingo and Amsterdam, a hub for its SkyTeam partner KLM, and adding an additional weekly frequency between Mexico City and Tokyo Narita. In 2015 both Aeromexico and Volaris directed the bulk of their capacity growth to international markets and they are adopting the same pattern in 2016. But general economic stability in Mexico is driving growth in the country’s domestic market. Aeromexico recently cited growth in Mexico’s General Economy Activity Indicator of 2.9% in Jan-2016. Mexico achieved 14.8% domestic passenger growth in 1Q2016, to 9.3 million. 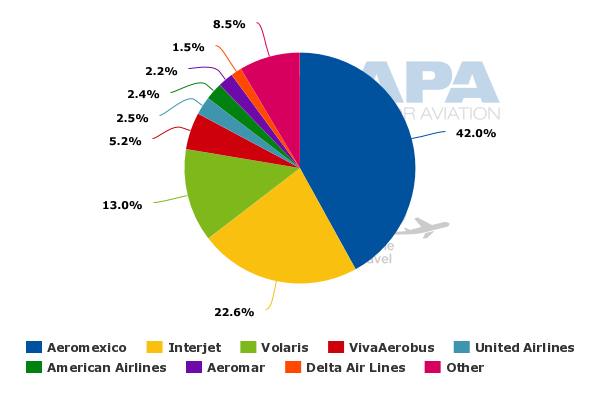 Aeromexico, which also includes Aeromexico Connect, achieved a 32% domestic market share, followed by Volaris at 28%. 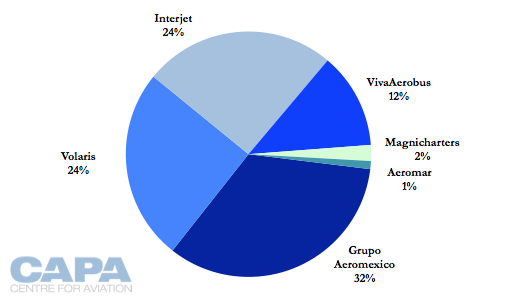 During the past couple of years Volaris and Interjet have toggled back and forth as Mexico’s second largest airline measured by market share, but Interjet’s share for 1Q2016 was 23% followed by VivaAerobus at 12%. 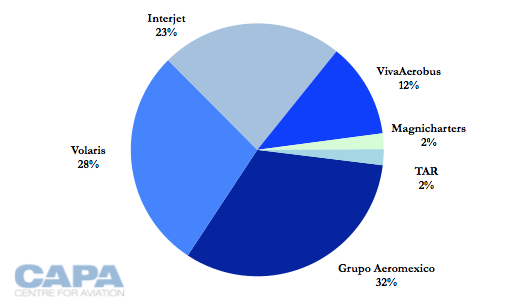 During 1Q2015, Interjet and Volaris each held a 24% share. Volaris executives have recently highlighted strong market demand, and that prices and yields were stable. During 1Q2016 Volaris’ yields fell 1.6% due to a 2% drop in average fare to USD65.6. But total unit revenues jumped 7.7% year-on-year, driven by growth in non-ticket revenue of 10.4% to USD21.4 per passenger. Company executives have stated that non-ticket revenues now represent 25% of total operating revenues, in 1Q2016 increasing 37.5% to USD298 million. The airline has been engaged in a campaign to lure travellers away from bus journeys in Mexico, and recently Volaris executives remarked that 30% of its customers had first considered taking the bus before opting for air travel. The company also estimates that it has more than 20 million domestic customers to capture from more than 50 Mexican domestic bus routes. Volaris’ main strategy is to target VFR traffic and the airline has estimated that those routes represent 49% of its network. Volaris has estimated that its market growth in that segment between 2010 and 2015 was 37%. Leisure routes account for 26% of Volaris’ network, and routes that target small and medium-sized business represent 25%. Using its stimulatory low base fares, Volaris plans to grow capacity by 17% to 19% in 2016, with the bulk directed toward international service. Aside from San José, Costa Rica; San Juan, Puerto Rico; and Guatemala, Volaris’ international network is devoted to US transborder routes. 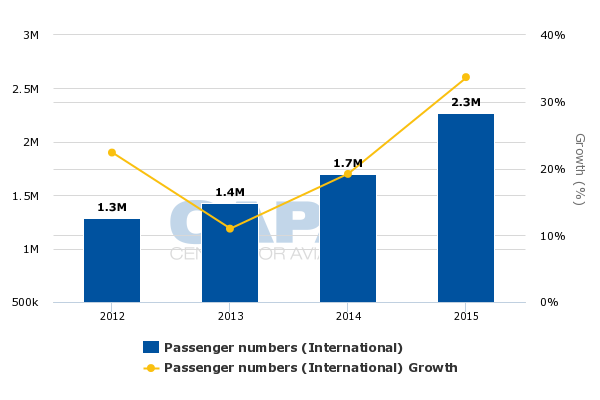 The company’s international passengers jumped 33.7% year-on-year in 2015, to 2.3 million. Some of the US routes that Volaris is launching in 2016 are uncontested, including Guadalajara to Seattle and Austin, Culiacán to Phoenix. Its service between Durango and Chicago Midway, launched in late 2015, also has no competitors. Volaris has cited numerous opportunities in the US transborder market, and has also previously stated that many of its transborder routes are demanding more capacity. The airline targets mostly VFR traffic on its US routes, on the basis that those markets have lower levels of competition. Volaris serves some of the major trunk routes between the US and Mexico but limited slots at Mexico City Juarez result in the majority of its US services (20 routes) originating in Guadalajara – its second largest base on a system-wide basis, and its top base measured by domestic seat deployment. The airline’s domestic rival VivaAerobus had a short-lived transborder push in 2015, but after completing a fleet transition to Airbus A320 family aircraft in 2016 has intimated that it could resume international growth in 2017. VivaAerobus’ largest base is Monterrey, and during its last transborder expansion in late 2014 and early 2015 it launched flights from Guadalajara to Dallas/Fort Worth and Cancún and Monterrey to Houston Intercontinental. During that period the company also relaunched flights from Monterrey to Las Vegas and San Antonio. Shortly after VivaAerobus had launched flights between Guadalajara and Dallas and Guadalajara and Houston, Volaris entered those markets. Those two markets in particular are larger, and the end-points are hubs for American and United, which also serve those routes. With a younger fleet of more fuel-efficient Airbus jets, VivaAerobus may also examine cross-border VFR markets. Aeromexico and Volaris have two different business strategies but both airlines have reasonably confident outlooks for 2016. Volaris is continuing to make a transborder push and Aeromexico is working to mature long haul markets that it has introduced in 2016. Although both airlines compete with one another vigorously, for now it seems that there remains untapped potential in the Mexican domestic and international passenger segments, and Aeromexico and Volaris show no signs of relinquishing their positions in the Mexican market.